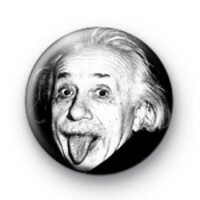 Funny Albert Einstein Button Badge featuring that famous photo of Einstein sticking out his tongue in black and white. This badge is perfect for any science geek, genius, nerd or physicist. Perfect for science teachers and physicists. These badges are really popular during the summer when science exams are taking place and many physics teachers buy them to give out to their students. 25mm button badge made by hand in our workshop. Available for worldwide delivery.